Trivia games are certainly one of the most popular games played among smartphone users. These games offer us to have fun and enjoy answering questions while testing our brain and our knowledge, helping us improve it with each question. With so many games offered to us, finding the best trivia game can be quite tricky. 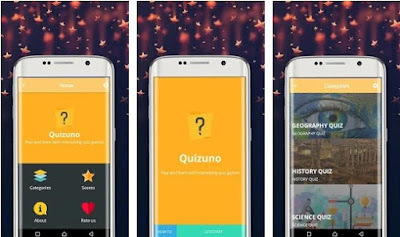 In order to help you with your search, we looked and discovered one great general knowledge quiz- Quizuno. Let’s see what this trivia game offers you. What is this trivia game about? This one entertaining and challenging trivia game which is specially created as a fun and addictive general knowledge quiz that is suitable for kids and adults. The game is developed for Android users that like to have fun playing while learning more and testing their general knowledge. With a user-friendly interface, colorful design and interesting categories of questions, players need to guess answers right in order to get scores. Players will increase their knowledge while enjoying answering questions and getting a chance to become the ultimate trivia player of this game. Quizuno has to offer its players endless fun while helping them to boost their general knowledge with each question they answer. Full of interesting, challenging and clever questions players will put their brain and knowledge to test. On the game, players get to choose from 5 different categories of questions like sports, logo, geography, history, and world culture. Players can choose any of the categories and they must answer all the questions in that category right. The game is giving players, a limited number of skips they can use but when they use all their skips the game will end. Every correct answer is giving the players scores and each player that answers the most of the questions right will get high scores and a chance to become the best trivia player. With the game, players will learn more, have fun and boost their knowledge, having fun and getting informed treating their brain each time they play. Download this game for free now on Google Play to answer fun and clever trivia questions!